The Scottish independence vote is a "wake-up call" says the chairman of the Welsh Conservatives as its party conference gets underway in Birmingham. Cardiff North MP Jonathan Evans said the ballot means the future of the UK constitution must be debated. He also attacked the defection of two Conservative MPs to UKIP as "contrived and choreographed". Welsh Secretary Stephen Crabb and its assembly leader Andrew RT Davies will address the conference later. Mr Davies has already said he wants to see a "low-tax revolution" in Wales, and his speech to the conference is expected to push that message home. 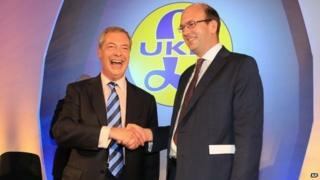 But the start of the conference has been overshadowed by the UKIP defections - including Saturday's announcement by the MP for Rochester and Strood, Mark Reckless. "The (general) election could either way and yet there is this very, very small group of people on the extreme right of the Conservative Party who look at this and think 'No, we don't want a Conservative victory," said Mr Evans. But he also told the BBC Radio Wales Sunday Supplement programme that the conference would reflect on the Scottish referendum - and a 45% vote in favour of independence. "All of us - across the whole of the United Kingdom - need to take that on board and come-up with an outcome that binds the United Kingdom together," he said. "I think it's a fascinating, very interesting time for our country." He said the current constitutional settlement was "asymmetrical" and "a recipe for ultimate division". "And goodness me - we've had a wake-up call to that," he added. Meanwhile on Twitter, former Welsh Secretary David Jones announced he had rejected an approach by UKIP. The Clwyd West Conservative MP said: "I'm a Eurosceptic and want a Euro referendum. "Only the Tories can deliver that. "So when UKIP tapped me up, they were told to take a hike."